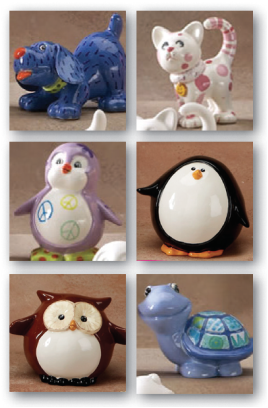 Pick from a large selection including: , cat, fish, dog, dragon, elephant, frog, robot, owl, penguin, pig, turtle, t-rex, shark, and unicorn animals; pudgy owl and penguin banks! Paint a truly unique piece of pottery just the way you like! 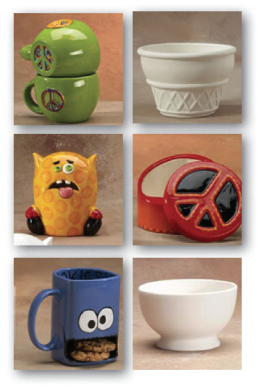 Includes all options from package #1 plus a great selection of functional items including: plates, bowls, mugs, monster banks, sports banks, food banks, and boxes. All pieces are functional and food safe! Contact us to ask about different clay project options! No need for party favors - Guests take home their pantings the same day! Parties are typically booked for 90 minutes which allows guests to choose a pottery piece, paint, studio staff to clean up, and food to be served. We have found that timing for our parties work well for most people. However, an additional half hour can be purchased for $30. Also, please let us know if you would like us to decorate the room with balloons and streamers for an additional $20. Finally, please let us know before your event if you would like us to make you a signature Party Plate with fingerprints and names of all party guests for an additional $30. This makes a unique keepsake from your party celebration! You are welcome to bring in food and cake to serve at the party. Please make sure to also bring any needed materials including plates, cups, cutlery, napkins, and drinks. Unfortunately, we do not have a freezer, so we recommend a small cooler for ice cream or anything frozen. In order to ensure that we can efficiently help all guests during the party and clean up, we ask that parents of the party guests not be in the party room during the event (unless there are any special circumstances that are agreed upon prior to the booking). Parents and siblings of guests are welcome to wait in our general store area where they can shop for books or movies or in our drop-in studio area where they can paint their own pottery during the party at a discounted rate of no sitting fee. Otherwise, they can enjoy some of the shops or restaurants that downtown Maynard has to offer. Parties generally work very well and without incident. Occasionally, very active children find it difficult to remain seated. 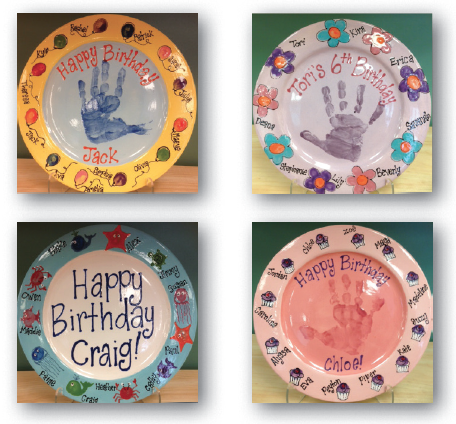 Since pottery is breakable and we generally have custom pieces in process, it is unacceptable to have children running in the party room or studio. Our staff will try to control this, but it will be up to the party parents to ultimately discourage this type of behavior. We will have to charge you for any broken items due to uncontrolled children. We require a one week notice for any changes to the time or date and a 72-hour notice for any cancellation to receive store credit. We very much look forward to hosting your special event. Please let us know if there is anything else you need or that we can do to make your party special! You are invited to a party at Art Signals Studio!! Art Signals Studio is housed within Video Signals/Kilby Books at 16 Nason Street in downtown Maynard, next to the Maynard Outdoor Store and opposite the Middlesex and Bank of America banks. There is free parking immediately behind the store in a private parking lot as well as many meter spots in the front and back of the store. Art Signals Studio sometimes takes photos of events and parties that are used in promotional and marketing materials or posted on Facebook. If you have a problem with your child being included in a group photo, please let us know, so that we can notify Art Signals Studio. To assist Art Signals' staff in helping all guests during the party, we ask that parents not be in the party room during the event. Parents and siblings are welcome to wait in the Video Signals store area where you can shop for books or movies or in the Art Signals drop-in studio area where you can paint your own pottery at a discounted rate during the party no sitting fee. Downtown Maynard also has some great little shops or restaurants that are fun to explore. We look forward to seeing you at the party!